Having endured cramped temporary classrooms, schoolchildren brave the cold weather and run happily on their new school campus. It's been a thousand days since the earthquake of the century "turned the earth on its head" in Wenchuan, Sichuan Province, China. Gone are the broken buildings and destroyed lives. New buildings fill the voids, and hopes for starting life anew fill the hearts and buoy the spirits of the survivors. It was late November 2010. Winter had arrived in Luoshui, Sichuan Province. A thick fog covered the grounds and buildings of Luoshui Tzu Chi Middle School. Braving the cold, Wei Yunlu (魏雲露) and her schoolmates traveled from their dorm to their classes. They walked with their hands pulled up into their sleeves and their necks hidden behind raised collars, trying to ward off the chill. Wei's strides, like those of her classmates, were slow and steady. Nothing in her bearing or appearance betrayed her close brush with death two and a half years before. On May 12, 2008, Wei was in the middle of a lesson when a magnitude 8 earthquake rocked China. Shocked and startled by the sudden shaking, many of her classmates froze in their seats, too scared to react. Wei wasn't one of them. When her school building began to collapse around her, she yelled for her classmates to get up and run for safety. As she herself was trying to escape from the crumbling building, she got trapped under fallen floor slabs and lost consciousness. Wei found herself in a hospital when she finally regained consciousness. Later she was told that most of her classmates never made it out. Sixteen of them survived, 23 others were not so lucky. While she was lucky to have survived, she didn't emerge unscathed—she lost her lower left leg as a result of the building collapse. She now wears an artificial limb in place of the leg she lost that day. Though she lost a part of her body, she has not lost her faith in life. "When I sped down the stairwell trying to escape the quake, all I could think of was to live," Wei recalled. "I still feel the same way about life today. The mere fact of being alive makes everything else possible." Her optimism is amazing, given the close brush she had with death. Not only that, but she's also had to cope with the aftermath of the quake, including learning to walk with her prosthesis and going to school in makeshift classrooms for more than two years until a new school was ready. On September 1, 2010, Wei started 9th grade at the brand-new Luoshui Tzu Chi Middle School, and she moved into the new school dormitory. She's devoting herself to preparing for the high school entrance examination in June. "I've been wary of heights ever since the earthquake," she said. "Luckily, the new class is in a two-story building, built rock solid. I'm not as scared now. I hope to study piano in a college of music, partly as a memorial to a good friend of mine." Before the quake, Wei's main artistic interest was dancing. But the disaster changed all that. Now that dancing would be more difficult for her to perfect, she wants to excel in piano—for herself, and in memory of one of her good friends who perished in the earthquake. Piano had just been a side interest before, but because her friend had been a gifted piano player, Wei wants to follow in her footsteps. Leaning on the guardrail on the second floor hallway of the new building, Wei looked out with hope at the large track field. The skies were clear since the fog had burned off under the bright sun. More than 80,000 people died in the Wenchuan earthquake. More than 3,000 schools were so severely damaged that they required extensive reinforcement if not complete reconstruction. 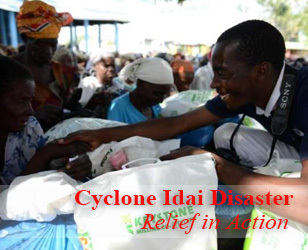 The whole country was mobilized to help. Luoshui has been under constant construction ever since the earthquake. As more permanent housing reaches completion, the demand for home furnishings is picking up. Stores selling furniture, drapery, and kitchen appliances are doing brisk business—signs that the wounds of the quake are gradually closing and that normalcy is returning. In Yongxing Park, a local haven in the town, people are playing cards, shooting the breeze over tea, puffing on cigarettes, or dozing in the cool shade. The leisurely ambience in the park is further proof of how far the city has come since that fateful day. The very same spot in May 2008, though, offered a drastically dimmer scene. At that time, the place was jam-packed with tents for quake victims. Tzu Chi volunteers streamed in and offered hot meals and free clinics. That went on for three months, until Tzu Chi established a service center in Luoshui to offer long-term care to quake survivors. Ever since the quake, Tzu Chi volunteers have been helping in Luoshui. The town has a population of 35,000, and virtually everyone is familiar with Tzu Chi and the love that it has brought from Taiwan. Huang Jiantan (黃劍談), a deputy chief of staff for the mayor of the nearby city of Shifang, observed, "Tzu Chi acts, and it doesn't just give money. Volunteers personally prepare and hand out hot meals, offer medical clinics, distribute relief goods, and help rebuild schools. 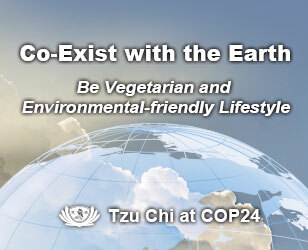 They also share the ideals and principles of Tzu Chi. I feel that they have given us their hearts, and they have influenced many of us here." Huang has seen many Luoshui residents volunteer with Tzu Chi, and he has been very impressed by the heightened awareness of the need for preserving the environment and for helping the less fortunate. After the Wenchuan earthquake, Tzu Chi helped rebuild 13 schools in the cities of Mianyang, Deyang (including Shifang), Chengdu and Yaan, with a total area 50 percent larger than Taiwan. The 13 schools, built under the foundation's Project Hope program, provide 268 classes for 13,000 students. At the beginning of 2010, students attended the first of the schools completed and returned to the others as they opened throughout the year. In particular, the foundation built four schools in the vicinity of Shifang: Fangting Tzu Chi Middle School, Luoshui Tzu Chi Kindergarten, Luoshui Tzu Chi Elementary School, and Luoshui Tzu Chi Middle School. Across the Liu River, not far from Yongxing Park, stands Tzu Chi Luoshui Kindergarten. The grayish white building complex conjures up the rock-solid, down-to-earth, and no-frills feel of Tzu Chi buildings. Another set of buildings, Tzu Chi Luoshui Elementary School, sits on the opposite side of the street. The scale and the architectural uniqueness of the schools will surely make them new landmarks in the town. Luoshui Middle School used to be located next to Yongxing Park, but it was destroyed in the earthquake. About 60 percent of the buildings in Luoshui were demolished by the earthquake. About 350 people lost their lives, including 108 in this school alone. No one wanted to rebuild the school on the site of such sad memories, so the new middle school has been located elsewhere. A hospital now occupies the site where the old school once stood. Though designed by various architects, all 13 schools built by Tzu Chi in Sichuan share core themes that value local features, functionality, aesthetics, sturdiness, and an overall atmosphere that fosters learning and character building. 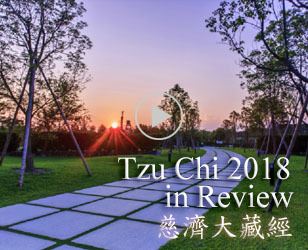 Tzu Chi architects aim to build schools that are not only functional, but also display an aestheticism that can endure the test of time; simplicity, neatness, and an aura of steadiness and serenity are the governing design principles. Architect Guo Shu-sheng (郭書勝), from Taiwan, elaborated on the design concepts for Tzu Chi schools: "When a learning space can calm students down, then they learn not to misbehave, and over time they come to have good manners." Tzu Chi buildings often feature pitched roofs—two slopes meeting at a central ridge—which, when looked at from the front, form an upside-down V. This resembles the Chinese character for "person," symbolizing the fact that the foundation's core values are based on respect and care for people. The exterior of the buildings is covered in gray pebbledash, which projects a calming aura. Natural elements like water, trees, and rocks are integral components of the overall architectural themes. Modifications at each Tzu Chi school are then made from this basic blueprint, to reflect local characteristics. For example, an ancient Confucian temple has been preserved right in the heart of Mingshan First High School in Yaan. The new school celebrates Confucius' spirit as an educator in a harmonious blend of modern buildings and this venerable temple. Similarly, Xiaoquan Middle School in Deyang features two 180-year-old ginkgo trees. Huang Jian-xing (黃建興), an architect from Taiwan, arranged the new dormitories on campus in such a way as to give the trees ample room to grow. This consideration for local characteristics highlights the heritage not just of the school, but of the community as well. Wei Youdong (魏友東), the principal of Xiaoquan Middle School, compared the school with nearby schools built by other aid groups. He affirmed that the other schools were indeed beautiful. However, "the no-frills simplicity of Tzu Chi schools becomes more engaging the longer you look at them." Referring to the lack of colorfulness of the Xiaoquan school buildings, assistant principal Zheng Menxi (鄭門喜) said, "The most vivid colors on a campus should be created by its students and teachers." Indeed, the Tzu Chi schools are being richly colored, metaphorically and sometimes literally, by those who learn or teach there. They do so when they perform a good deed, utter a kind word, make an awesome wish, eliminate a vice—small acts that make the world a better place. Teachers at Luoshui Tzu Chi Elementary School led 200 students in planting 15,000 tree seedlings on the school grounds. In time, the campus will be very green. Quan Shaoqiang (權少強), the principal, vowed to make the new campus free of cigarette smoking. He led the way by first kicking the habit himself. Many other Project Hope schools have followed suit. They are also advocating recycling on their campuses. Teachers and students at Fangting Tzu Chi Middle School worked together to lay interlocking paving bricks on campus. Pathways made with such bricks are more environmentally friendly than ones paved with concrete. The bricks allow rainwater to seep back into the ground and help maintain the water table. After reconstruction, Qianjin Tzu Chi Elementary School in Yaan is now regarded as the best school in the area. Even parents that do not live in Qianjin want to enroll their children in the school. Principal Song Ruwei (宋如偉) is first picking students that live in town, to avoid spreading the school too thin and attenuating the quality of its services. It is important to Song that the school will instill in its students not only academic knowledge but also less tangible wholesome human qualities. He encourages the students to be well-mannered in everything that they do, be it talking, eating, or moving about. To set examples for students, teachers in the school must "walk the talk" and demonstrate these fine qualities in their own actions. For instance, a teacher should pick up garbage whenever he sees some on the ground. Wu Shengbin (吳勝斌), the principal of Hantan Tzu Chi Elementary School in Chengdu, echoes Song's ideals. Wu has returned to the frontline of teaching from a long stint as a government education official, precisely to advance local learning standards. Like Song, he wants to help elevate the caliber of education in the community and to offer a well-rounded education to students. Wei Youdong, the principal of Xiaoquan Middle School, was devastated in the aftermath of the earthquake. He often sat on the school sports field staring at the rubble that had once been his campus. He lost 33 pounds in less than three months. It was only after Tzu Chi decided to sponsor the rebuilding of his school that he "became alive again." His spirit has been further lifted now that he has seen the quality buildings constructed by Tzu Chi. Zhang Kun (張鯤) is the principal of Youxian Tzu Chi Experimental Middle School in Mianyang. He contended that no contractors in Mianyang could match Tzu Chi when it came to the quality of construction. "Tzu Chi came several thousand miles from Taiwan to help us rebuild," he observed. "They gave the money, and they are such sticklers for quality construction. How can we not cherish their precious gifts?" Construction started at some Project Hope schools in late December 2008. Reconstruction at more schools soon followed. Zhaoyang Tzu Chi School, in Mianyang, was the last one to begin construction, in late 2009. The school, for grades one through nine, is also the only one that has not been opened to students yet. It is scheduled to be completed in 2011. Lin Min-chao, (林敏朝) the director of the Tzu Chi construction department, pointed out that foundation construction personnel from Taiwan are always on hand at each construction site in Sichuan to monitor progress and ensure building quality. Some are paid and some are volunteers. They typically spend four to six months for each tour in Sichuan before they return to their lives in Taiwan. Few aid organizations can make this kind of claim. The foundation insists that schools and hospitals should be built to particularly rigorous standards so that they can shield their occupants from future disasters and function as emergency shelters. Occasionally, gaps in construction practices between Tzu Chi and local contractors have surfaced and have slowed down construction. Fortunately, all parties have been able to arrive at agreements, and the Tzu Chi commitment to quality has always been upheld and achieved. "Government leaders have seen that we mean business when it comes to quality; we're not just giving it lip service," Lin said. "When quality fell short, I'd ask the contractors to, for example, undo the concrete molds, untie the steel bars, and start over the proper way." Tzu Chi also shows its doggedness in the pursuit of quality when it comes to pebbledashing the exterior of buildings. Taiwan first learned of the pebbledashing method (setting small stones in plaster on exterior walls) from China, but today the method is more popular in Taiwan than in China. Local contractors in Sichuan were generally less well versed in its application than Taiwanese workers. Tzu Chi sent in technical consultants to bring the local builders up to speed. Jiang Rong-xi (江榮溪), a staffer of the Tzu Chi construction department, said that the foundation also sent people to Guangdong, Fujian and Jiangsu Provinces to scout for suitable pebbles. "It took us three months just to find the right pebbles. They were then subjected to six to eight hours of polishing to remove sharp edges and to reach the desired smoothness," Jiang said. By August 2010, Jiang had spent more than a year in Luoshui for the Project Hope schools in that area. They had occupied his waking hours there, and he had seen them emerge from the ashes and grow into strong buildings. It is no wonder that at the inauguration ceremony Jiang felt as if he were a proud dad giving his grown daughters away at their weddings. On November 19, 2010, the foundation held a joint inauguration ceremony at Luoshui Tzu Chi Middle School and turned the 13 schools over to the care of their respective administrators. Festive red lanterns adorned the school front gate; a dragon dance accompanied by the din of gongs and drums welcomed the guests. Among the guests were the principals and representatives of the teachers and students from each of the 13 schools. An air of celebration filled the town, drawing more people to the festivities. Also gracing the ceremony were representatives of organizations that had helped make the project possible. Chairman Chen Yunlin (陳雲林) of the Association for Relations Across the Taiwan Straits (ARATS) spoke at the ceremony: "Today we see neat buildings, children's sunny bright smiles, and the transformation and ascension from the earth-shattering destruction here. We want to sincerely thank our brothers and sisters in Taiwan for their love and Tzu Chi volunteers for their enduring help. They have given life back to the disaster zones." Tzu Chi representative Wang Duan-zheng (王端正) handed a sweet osmanthus tree sapling to each principal to symbolize the transfer of the school from Tzu Chi to local administrators. The saplings would be planted on each campus to grow as the students grow and learn.